Sergeant Arthur Bowman is a fifteen-year veteran of the East India Company’s private army when he and his team are taken prisoner in Burma in 1852. Six months of torture leave him mentally and physically scarred when he is released along with nine of the men who were captured with him, and he returns to London. Working as a policeman, he finds a body in the sewers, a body whose mutilation is uncannily like his own, with the word “SURVIVE” daubed in blood beside it. Only ten men could have perpetrated this horrific crime, and Bowman is determined to find out which one before the crime is pinned on him. From Burma, through Nineteenth Century England and the burgeoning New World, we follow Arthur Bowman is his search for a killer, and for a reason to live. Antonin Varenne’s new novel is a wild departure from his earlier, noirish offerings, but anyone who has read those earlier works will immediately recognise the author’s skilful hand in this Patrick O’Brian meets Arthur Conan Doyle meets Larry McMurtry epic of one man’s search for retribution and redemption in both the beautiful narrative style and the intense, gritty world that Arthur Bowman inhabits. Bowman himself is a hard character to like, a man who speaks little and seems to hold those around him in contempt for much of the time. When he is tasked with picking a group for a special mission that he will then lead, he finds himself facing capture or death, and shows – in no uncertain terms – what he is prepared to do in order to survive. Varenne places us, very early in the story, in the middle of a pitched river battle in which we get to see the true Arthur Bowman, a man for whom we have had very little empathy up to this point, but whose actions and interactions endear him to us as violence rages around him. His time in England, just another damaged war veteran, builds upon this stoic character to show us how far he will go to obtain justice. One of the men he chose that day in Burma is now a murderer, and Bowman feels no small measure of blame for it and so, pulling himself together, getting his life into some sort of order, he sets out to find which one and make him pay, going so far as to follow the series of murders first to America’s East Coast and then out west to where many are attempting to make their name and their fortune in fabled lands riddled with gold. As Bowman’s story progresses, our opinion of him changes as we watch him come out of his shell, a man of integrity and a sense of duty who carries on despite the pain it might cause him. Bowman is obviously damaged, both in terms of the physical scarring that covers his body, and of the less-visible emotional scars, but is not so damaged as to still understand that what he suffered has no place outside the jungle camp that was his home for six months. What’s interesting here is Varenne’s decision not to focus on the violence, not to describe what Bowman went through, nor for that matter, what the killer’s corpses look like. It is somehow more harrowing knowing that something happened, even if we only catch brief glimpses of the details in a throwaway line here – about Bowman’s facial scarring – or there – about memories of other men being taken from their cages. 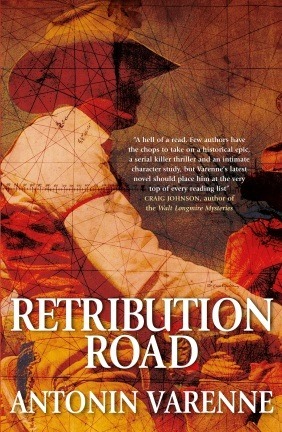 Retribution Road feels like three distinct novels in one: the historical epic covering the Second Anglo-Burmese War of 1852; the detective novel set in the grimy streets of Victorian London and England; and a story of rebirth as Bowman reaches the vast plains of the wild West. It’s beautifully written, Varenne’s distinctive style shining through Sam Taylor’s wonderful translation, and impeccably researched. While Bowman stands firm at the centre of the story, he comes into contact with many other people who leap from the page, regardless of how briefly they appear therein, or of how much impact they have on Bowman’s journey, on his transformation from automaton-like soldier to human being, lover, father, friend. A stunning, epic tale from an author who is not afraid to step outside his comfort zone, Retribution Road is an entirely engrossing read that, despite its heft, will still leave the reader wishing for more. It’s a dark story with a surprisingly warm heart, the tale of a man who we should never come to like yet who, against all odds, settles himself comfortably into the reader’s consciousness, staying with us long after the story has finished. With Retribution Road Antonin Varenne proves that he is an author who deserves to be on your “must-read” list, and offers his work to a much wider audience than his earlier novels might. If I could only recommend one book this year, this would probably be it.